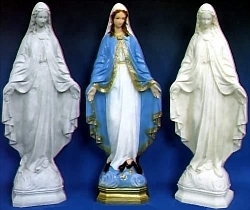 This Our Lady of Grace Garden Statue features the popular image of Mary with her outstretched hands. This outdoor garden statue can also be used as a memorial statue at the cemetery. It is made from durable, polyvinyl resin so it is unbreakable. Filling this Garden Statue with sand, gravel or cement will make it heavy to withstand wind. 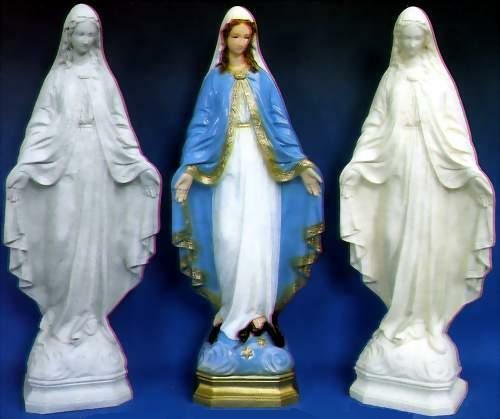 This Our Lady of Grace Garden Statue is available in several different finishes. What a beautiful addition to any garden! Patina is a dark, aged-look finish.